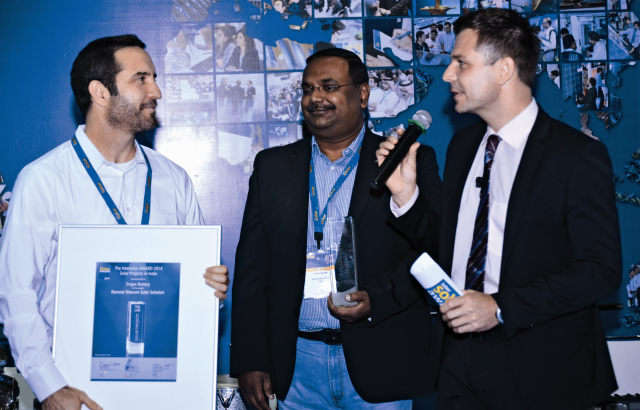 Trojan Battery’s Mat Segal and George Mathew from Team Sustain accepting the Intersolar India award. Intersolar India, one of India’s largest exhibition and conference for the Solar Industry, concluded recently in Mumbai. The Intersolar AWARD for the best and most innovative Solar Projects in India category is one of the highlights of this exhibition. The Intersolar AWARDS for the present year 2014 were given to Bosch Ltd., Tata Power Solar Systems and Trojan Battery. We explore the Solar Project conceived by Trojan Battery and assess it for its innovation and social transformation ability. Trojan Battery, one of the world’s leading manufacturer of deep-cycle batteries, and its project partner, Team Sustain, were recognized at Intersolar India for their Remote Telecom project featuring Trojan’s new advanced lead acid Smart Carbon™ batteries. Trojan Battery and Team Sustain’s Solar Project solution is aimed at enhancing the ability of remote mobile towers located in rural India. The vision for the project is that mobile telephony is the communication backbone for rural India, and enhancing their ability will only contribute to the region’s social and economic development. Team Sustain’s hybrid photovoltaic system with Trojan Smart Carbon™ batteries will significantly increases telecom tower up time supporting financial and mobile communications services. A key component of the project is the use of Trojan’s Smart Carbon™ batteries to address Partial State of Charge (PSOC), a common issue in solar off-grid applications that has not been addressed by battery manufacturers until today. Housed in a unique climate-controlled battery cabinet developed by Team Sustain, allows for passive cooling to decrease the site temperature for the batteries, without drawing power from the system or batteries. The climate-controlled battery enclosure also features a battery water reservoir and tubing with mechanical automatic floats for easy watering; sensors to monitor temperature, voltage and current; and a communication bus incorporated inside the combiner box to transfer the collected data to the remote servers. To ensure reliable transmission of critical system data, Team Sustain developed the Green Energy & Energy Management System (GeEMS), a remote monitoring software program which enables customers to quickly and easily monitor the operation and health of the entire telecom site including the batteries which power it. The software connects to the system’s controllers and wireless telemetry to manage the battery bank. The battery bank’s state of charge (SOC) is monitored by the software, with key information transmitted and stored on off-site servers for later data evaluation. The mobile phone is indeed the backbone of communication in rural India and has penetrated even the most remote parts of the country. Any project aimed at strengthening this communication network will go a long way in bringing an overall development of India through the dissemination of timely information as well as inter-connectivity. Trojan Battery and Team Sustain have therefore struck the right notes by merging solar power with rural development.